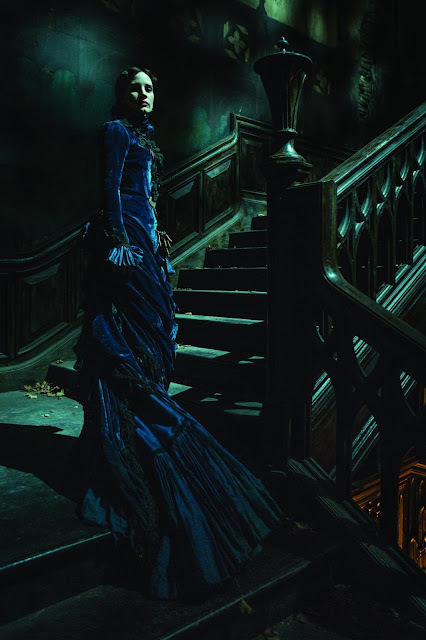 Home / CELEBRITY NEWS / Jessica Chastain Embraces the Dark in "Crimson Peak"
Jessica Chastain Embraces the Dark in "Crimson Peak"
The mysterious Lady Lucille Sharpe will do whatever it takes to protect her family’s shocking history…but not all secrets can be buried. Two-time Academy Award® nominee Jessica Chastain (“The Martian,” “Interstellar,” “Mama”) plays Lady Lucille Sharpe in Guillermo del Toro's gothic thriller “Crimson Peak” from Universal Pictures. In the film, the introverted and mysterious Lucille grew up quarantined at her ancestral home, Allerdale Hall. She shared what little love she knew with brother Thomas (Tom Hiddleston) and spent her days playing the piano and collecting moths and butterflies she found around the manor. She finds herself jealous of her brother’s attention for other women and protective of their familial connection. Lucille’s obsession leads her to foster the darkest parts of her humanity, and her conniving schemes hold Thomas hostage to the past.